With over 100,000 students walking out province-wide, it provided many with an opportunity to have their voices heard, particularly here in Orangeville, as a group of more than 200 youth from Orangeville District Secondary School and Westside Secondary School gathered in protest outside Dufferin-Caledon MPP Sylvia Jones’ Orangeville office on Broadway. Kirsten O’Brian has been involved with the movement since the beginning of the school year. A Grade 11 student at Westside, Kirsten has several concerns over the way the PC government is going about announcing its changes. However, Education Minister Lisa Thompson offered a different perspective saying in an interview with CBC Radio’s Metro Morning, that larger class sizes will be more beneficial for students by making them more resilient. “When students are currently preparing to go off to post-secondary education, we’re hearing from professors and employers alike that they’re lacking coping skills and they’re lacking resiliency,” she said. Many of those who walked out on Thursday were Grade 12 students and will be graduating in June. Many of them raised concerns that the PC government’s cuts to the Ontario Student Assistance Program (OSAP) will preclude many from attending post-secondary. Referencing the PC government’s planned reform of education, Ms. Jones noted this was something that would “finally” put student success and the priorities of parents first. While some in the community derided those who walked out as just skipping class, or not knowing enough, one student took issue. “They say we don’t know anything but you learn what you need to learn,” said Kailey Verner, a student at ODSS. “The Students Say No provincial organizing team does not condone or support any subsequent methods of action (such as a ‘student’ strike) unless otherwise spread by the organizing team themselves, which will always have the ‘Students Say No’ logo on it. 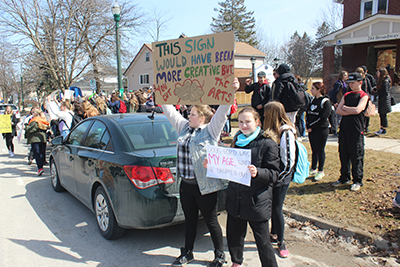 we are HEAVILY discouraging a student strike and any further walkouts,” said Deelan Sabido, a provincial organizer and Grade 11 student from Milton.